As a self-taught metal sculptor, Don De Mott has recreated many scenes of the American West in amazing detail. The latest subject, aspen tree sculptures, was inspired by his adoration of picturesque Colorado, Always one of a kind, each piece is entirely hand welded. Meticulous coloring and painting is applied to accurately represent nature’s beauty. Don went to work at the age of 15, learning welding from his brother. John DeMott started a metal sculpture business in 1972, selling his crafts at art shows in Southern California. Before long, John’s sculptures were selling out. He opened a shop and hired help to meet the demand. Don was John’s first employee. The company grew fast and sold to big accounts, such as Macy’s, Broadway, Bullocks, J.C. Penny’s and many more. In those days, many of the sculptures were sailboats and sailing ships, fashioned into wall art and table décor. There were also some country scenes from the old West. De Mott Corporation expanded with 80 employees and the other siblings – Nick, Marc and Debbie – joined the ranks. The venture ran nearly 20 years. In the late 1970s, John left De Mott Corporation to pursue a career as a painter of the American frontier. Don became the head designer and continued producing top-selling works of art in metal. Inspired by the song “Rocky Mountain High” by John Denver, Don was curious to see Colorado. In 1979, while driving from Texas back home to California, he took a scenic route through the southern part of the state. The breathtaking experience of aspen trees blanketing the countryside changed the course of his career. 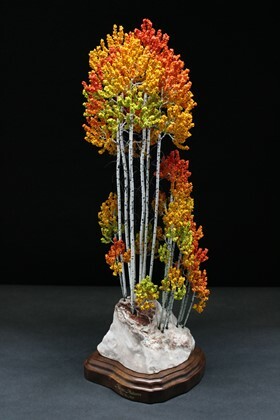 Don began working with metal to recreate the aspens. In 1981, Don donated his first aspen sculpture to the auction benefitting John Denver’s Windstar Project. On a cold January morning in Aspen, Colorado, Don explored the auction site before the big event that evening. Looking for help with directions, Don happened upon a man wearing a big winter coat, a hat and sunglasses. The helpful stranger turned out to be John Denver. At the auction, Don’s first aspen piece was sold in a lot that included an original landscape photograph taken by John Denver. Don spent his summer vacations in the 1980s camping in Colorado and photographing the aspens. Meanwhile, he honed his craft. In 1989, he launched a gift line called “Colorful Aspens.” Attending trade shows in Los Angles and Denver, Don opened several retail accounts throughout Colorado, from small gift shops to larger National Park stores. In 1993, Don relocated to Loveland, Colorado, where he continues his work today. In 1996, Don designed a much larger aspen sculpture that was intended to make a bolder and more impressive statement than the smaller items in the gift line. The piece sold quickly in a fine art gallery in Vail, Colorado. The success prompted Don to changed directions again and he began focusing on larger works. His aspens have sold in galleries in Colorado, Wyoming and Utah. Today, three of the De Mott brothers are accomplished artists: Don De Mott, metal sculptor; John De Mott, painter of the American frontier; and, Marc De Mott, sculptor of game fish.